Sweden is a member of the Nordic group of countries situated in the Scandinavian peninsula. It’s a large country -the third largest in Europe in fact. 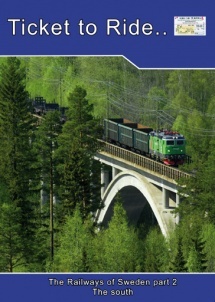 We look at the railways in the south and south east corner of the country, including the towns of: Malmö, Lund, Trelleborg, Ystad, Kristianstad, Älmhult, Alvesta, Växjö, Nässjö and Jönköping. We enter Sweden via Germany using the Sassnitz to Trelleborg ferry. The ferry carries the Berlin Night Express and freight wagons, 68,000 of them in the last recorded year. We watch another train ferry; this one from PKP arriving at Ystad, visit the vodka town of Åhus and then head for Malmö where the City Tunnel is under construction. We head north along the south Sweden mainline catching SJ X2000 sets pounding through the forests at 200kph and spectacular freights from Green Cargo, (see the Co-op train) Hector Rail, STENA and others. Jönköping has a stunning lakeside location, new regional “Itino” trains from Bombardier and lots of freight. There are distribution centres for some of Sweden’s biggest brands located on a trading estate nearby - IKEA and Electrolux are here.